I love this gal! This is my first shot at her and I have some tinkering to do and then some fun ideas for variations that are so super cute… in my head. Hopefully they’ll be work in real life. I love this flat pillow type doll. She’s stuffed super firm so she’s not about bending limbs. 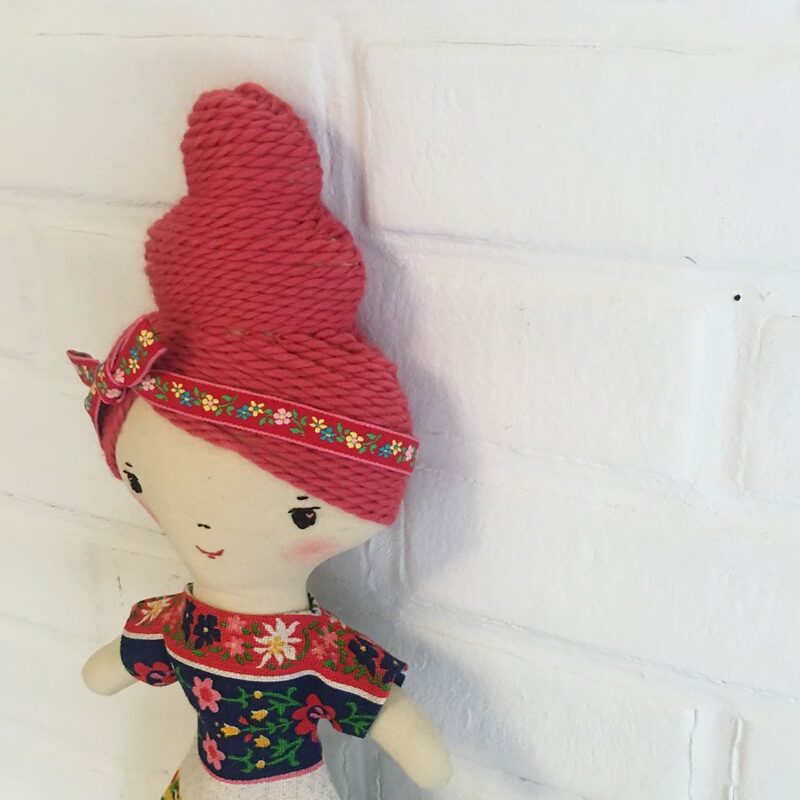 I love this type of doll for a more art doll/display type deal or also a huggable pillow doll for toddlers. And without the loose flowing yarn hair she’s great for toddlers. I’m thinking the next iteration I’m going to make of her will have felt or fur hair, even more huggable for little kids. This coiled, wrap around yarn hair really isn’t that difficult and I think is a super fun look. But sewing down the yarn is sort of time consuming so I wanted to make a very simple non-fussy outfit to go with her. I tried to make the dress very stiff and flat so that it keeps a sort of cartoonish, exaggerated shape. I’m going to try it again in an even more stiff fabric. It reminds me of the outfits I made for the spoon dolls in the book. 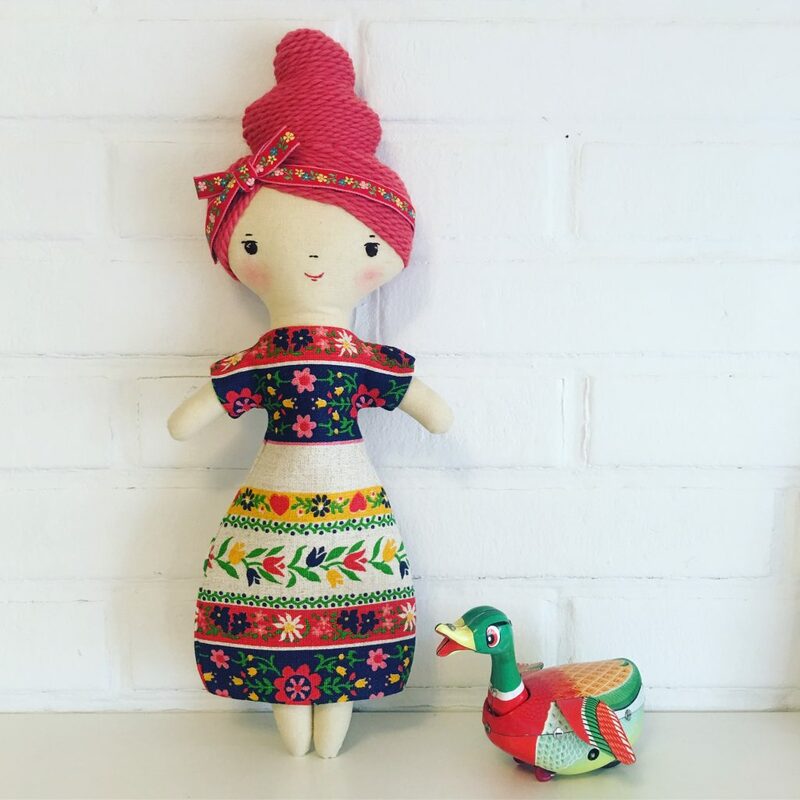 I have made two versions of your book’s folk doll – so adorable! she is wonderful, look forward to seeing what you come up with !! Love your wonderful creativity that you share with all of us. Happy New Year! This type of doll is why I bought your book! I look forward to buying the patterns from YOU in the future! Keep up the great work! She’s soo cute! I love her hair and her dress. I also really like the Mrs. Claus doll you posted on Instagram. That style would be great for a set of Nativity dolls. They would make a nice display and the kids could play with them. i would like to ask you to give me some more information about the “wee wonderful book ” and the “wee wonderful patterns”…..how much does each one cost, what does each one contain etc…..